TL;DR Download Unity and create a project. Add a terrain game object. Size it to match the map proportions. Add the map as a texture. Use the fixed height terrain tools to paint the appropriate parts of the map to the right elevations. All done. With Fog, Sound Effects, et.al. I have been a big fan of Mike Schley's Dungeons & Dragons maps for a while. Their high resolution and detail make them great for working with on alternate platforms. Recently, I decided to try and convert some of his maps of Barovia from Curse of Strahd to display on HoloLens. Well... and this is going to be a short post... it turns out to be really easy and not necessarily deserving of too much detail, but I'll pad it a bit to make it look a bit more impressive. First off, I used Unity, which you can get for free. There are technical preview builds for AR/VR platforms — I used this one for HoloLens. In my case, as I'm building for HoloLens you need that though you could also use the HoloLens emulator. If you wanted you could also build for another platform — this process should work equally well for Occulus, Cardboard, etc., or even just for display within Unity or even output for PC, just wouldn't be a holographic virtual 3D map. 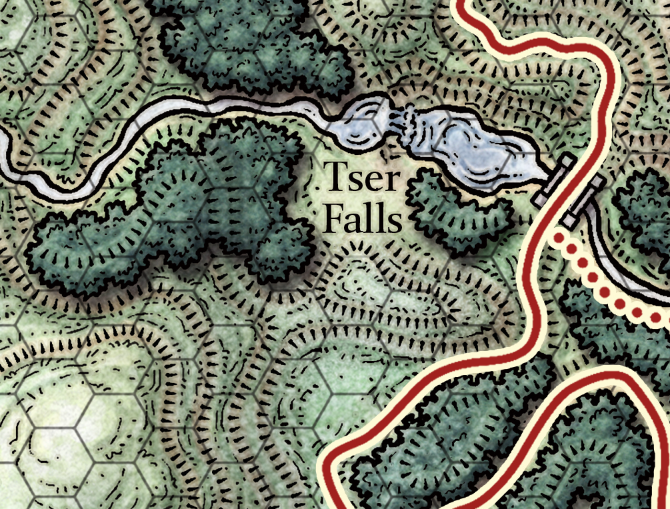 First I trimmed the edges of the Barovia map — not technically necessary but helps to reduce file and image sizes a bit. This left me with a map size of 7050 x 4400 pixels representing ~90K x ~56K feet or 27,538 meters by 17,187 meters. The map of Barovia has contour lines which will be used for elevation. The contour lines are 1000 feet each or 10K feet from lowest to highest elevation. The next step was a bit of math to determine the display size. Unity uses arbitrary units and HoloLens works on a scale of 1 Unity unit = 1 meter. I wanted the map to be big, so to fit (barely) my living room, I chose a scale factor of 2000 which ends up with a map size of 3.525 x 2.2 which is both the Unity map size and the size, in meters, of the resulting hologram. Within Unity I created a 3D terrain. Select the terrain object, and go to settings. Set the length and width to 2.2 and 3.525 (the z and x axis). For the height, if using the same scale as the length and width, it would end up being around 0.05. However, when I tested this it was less dramatic than I would like. After experimenting with various options I settled on a 4x vertical scale on the y axis relative to the x and z, which ended up at 0.2 height. With my vertical scale set, each increase in a contour line — 1000 feet in the map — is an elevation increase of 0.02 in Unity. The Unity terrain tools are not well loved, and many people use third party tools, but the built in tools are free and you can get what you need done, if a bit slowly. With the terrain selected choose the Paint Texture tool and then Edit Textures. Add the map (the map of Barovia that is) and set it to the same size as the terrain itself (2.2 by 3.525). Next select the fixed height terrain tool. Using the hard edge brush with a 100 opacity and then a height equal to the elevation (in contour lines) you are painting x 0.02. I tend to vary the size of the brush as I go. Then I painted the map, raising each contour section of the map's elevation. When roughly done there was a fair amount of touch up but as the contour lines themselves stretch between the lower and higher elevations they handle distortion well. Below are examples from a call out map of Yester Hill. I also looked at smoothing the terrain between elevations, but this quickly started to look like a couple orders of magnitude more work and a lot more artistic judgement than I had time for. Once that was done, I set various HoloLens specific settings, built and deployed to HoloLens. As HoloLens has built in video capture I could create video of the result and save it. And that was version one. For additional versions I made it darker with moon and moonlight, added spatial sound effects — sound that emanates from a specific location and varies by direction and distance, fog clouds from the Unity standard assets, as well as lightning, and more. 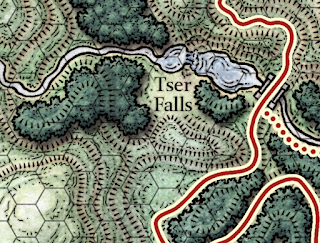 I also added gaze events to open additional maps such as this one of Tsolenka Pass. This map was generated at mini / battle map scale to 5 map feet = 1 physical inch. The map has 1000 feet of elevation which results in a holographic object that is 16.67 feet tall. This is amazing! Have you continued to work on these? The Tsolenka Pass is particularly great to see because your VR shows just how massive those cliff walls really are when compared to the original map. Thanks! I've been working on using machine learning to create relief maps but its been slow going. Next up, I thought I would try and build something similar for D&D mass combat. We'll see though.